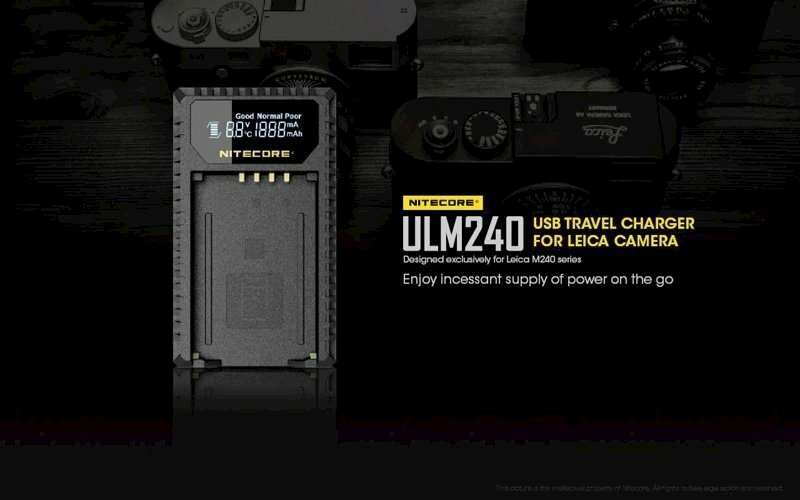 Marrying rugged construction with functionality, this usb travel charger from Nitecore is compatible with leica leica's bp-scl2 batteries. Its main feature is a versatile LCD panel which displays charge levels, total charged volume, and charging temperature simultaneously, and it can also be switched to show voltage and charging current. This panel is encased in a fire-retardant pc and abs shell that is designed to cope with several kinds of outdoor environments, while still managing to keep the product compact with a total weight of 1.83 oz. The USB travel charger outputs approximately 8.2v and can achieve a maximum output current of 1000ma, and accepts 5 vdc / 2a input through its USB cord. The cable can be stored in a trough located in the back for easy transport. Other features of this charger include an initial low current test for diagnosing battery status, attempted recovery of over-discharged protected batteries, and protection against incompatible models or short-circuited cells.